Is it really worth paying more to download AIFF, WAV or FLAC or should I just download MP3 music? Over the last few years there have been many debates within the DJ and club community as to what is the best digital audio format. Whilst two camps sit polarised between analogue and digital, there is also disagreement amongst the wholly digitalists. Compared to vinyl, digital DJing provides a wide variety of options so it is important to understand why any DJ keen to stand out from the crowd investigates the options available to them. 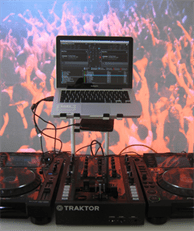 All DJs have several things to consider, whether just playing for personal enjoyment at home or on the circuit as a professional. These are not just what tracks to play and interfaces to use but the audio format and quality. While it might seem fine to play 128kbps files from illegal upload sites and content ripped straight from YouTube, it could be a false economy. There might be a time when you play out on a big soundsystem in front of a paying audience and those cheap rips are not going to cut it anymore. So the rule of thumb is try to get the best quality always if you want to play out live and make a living from your DJing. By doing so, club promoters and fellow DJs will take you more seriously. That said, if you have no aspirations to go public and just want to get more for your money then cheaper, lower quality formats are fine. This also applies to bedroom radio DJ, whilst sourcing great quality audio is great, it is not so essential when broadcasting live to the Web. This is because many of your listeners are likely to be listening on their laptop, tablet or mobile phone. Whilst some internet stations are capped at a certain broadcast quality, so trying to play something at 320kbps may just crash their system. There are many arguments around on the web as to the differences between the various file formats. So it is important to understand why they exist and that in reality there is a genuine difference between them. The dominant digital audio format is MP3 and has become so by its convenience as a format. However it is not the best format, just the most popular in terms of consumption, streaming and storage. So it is perfectly fine to have lower quality MP3s for your computer and audio player - as it was designed for those platforms - but not always for playing through a 5k soundsystem at a top venue. With the cost of digital storage, hosting and streaming quite cheap these days, having enough disk space for your music is less of an issue. Nevertheless a legacy remains that means many DJs still try to squeeze as many audio files onto their drives as they can, and that comes at the price of sound quality. MP3 is a 'lossy' compression format, so the data from the original sound file is made smaller. Compared to uncompressed CD quality which is 1411kbps, MP3 is just a fraction of that. Simple math will tell you that a 128kbps MP3 track will be about a eleventh of uncompressed CD audio, so some of that quality gets lost in translation. Any original, quality recordings - whether on vinyl, CD or digital - will not have been produced in an MP3 format, they just get converted to that later. So this compression involves losing some of the data from the original recording, which in audio terms usually comes from the bassy end of the spectrum. WAV has been established for quite a while and was developed by the big hitters Microsoft and IBM. Aside from it appearing as a standard format for anyone owning a Microsoft computer it also reproduces good quality sound and as a result is very popular with many DJs. Many studio producers work in WAV format and it is a good format to chose when disk space is not an issue. On the other side of the fence we have Apple's equivalent and AIFF. This format matches WAV virtually pound for pound but is less adaptable as WAV once you try and play your audio on a different platform, whereas you can play WAV files on a Mac. The last of the trio of dominant formats in this section is FLAC which unlike the other two is compressed to about half the size of the other two. What FLAC loses in size it makes up in quality, although it is likely that some will state they can tell the loss in quality compared to the other formats. There are other audio formats that are classed as Lossless but are rarely used by DJs. 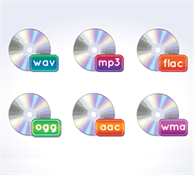 The difference between MP3, AIFF, FLAC and WAV audio formats, how do they compare? We have discussed the dominant format of MP3 to some extent as an audio file as it is the most adaptable and convenient for different scenarios. Many DJs play out using MP3, which is fine, but consider the difference in quality between MP3s as it is well worth investing in the higher quality 320kbps files. That said, lower quality MP3s might sound fine on higher end sound systems, but at some point you are likely to get found out when playing on a poorer system. There are other formats available and they like MP3 can vary in size and quality. Other Lossy formats include AAC which was designed to be the successor for MP3, whilst WMA is Windows Media Player format, something you are unlikely to see used by DJs. If you wanted to test the difference between a 320kbps and 128kbps MP3 file visit The Noise Addicts website to take their test. Naturally Mac users will often favour AIFF, Windows users picking WAV. The problem for any DJ making a career arises when you start to a build a collection that is made up of different formats and bit rates. If you have started with one format and like it, stick with it but it is always good to chat to other DJs to discover their preferences. It is also important to note that as your collection builds you get into the habit of tagging of your tracks. Obviously the majority of legally bought music will come with some kind of metadata embedded into it, but older tracks might not be complete. Also there is the issue of discovering special edits, Creative Commons and netlabel releases and remixes hosted freely that again might not contain all of the data. This is fine whilst browsing through your collection on your laptop but could became a pain when trying to use Traktor or Serato in a club and every other track has no or partial information. WAV files can be tagged with metadata but applications such as DJ mix software may not be able to see this data. A useful resource specifically for tagging WAVs for accessing via other players and platforms can be viewed here. Whilst AIFF files can be tagged allowing Traktor to read them within the software, Beatport supplies AIFF pre-tagged MP3s. When hosting your own mixes size can matter, especially for DJs with a tight budget. The two most popular DJ hosting sites, SoundCloud and MixCloud offer two different options. SoundCloud is more restricted with their free account capped at three hours of audio, how you use those three hours is up to you. Whilst you are restricted to just a maximum of 100 downloads and very basic stats and of course you do not have to use the download functionality. The Pro account doubles that to six hours and Pro Unlimited to unlimited uploads. MixCloud has no download options and is more for DJ mixes and podcasts, although some do host just single tracks which is more popular in SoundCloud. Originally uploaders were restricted to just 100mb per upload which impacted on the quality of the audio. 100mb would usually result in a very short mix if the audio quality was 320kbps. This was extended to unlimited file size uploads in 2011, allowing DJs more freedom with the quality of the audio file. Quality always comes at a price, even if we are talking about individual audio tracks. The better the quality the more you will pay, such is the law of economics. While this might put some DJs off from spending more due to limited budgets, others need to consider quality over quantity. There is that decision whether to buy more tracks or invest better quality audio, the temptation might be to go with the former. So whilst that is OK for the bedroom DJ, their club-based cousin should consider the other option and spend some of that hard-earned money on better quality audio. If we are talking about a dozen tracks per week then this cost will be quite nominal. For example a typical 10 track album will cost between one-two pounds more for the WAV versions over MP3. Whilst a 320kbps MP3 will cost more than a lower bitrate version. There will always be disagreement between which is the best format to use, WAV versus MP3 versus FLAC, so on and so forth. Where possible always try and get the best quality for peace of mind, if funds are limited then do what makes you feel comfortable. For every person who tells you they can tell difference between the MP3 and WAV versions of a track, there will be one who cannot. Added to that is the variables of the amp, speakers, sound system, sound card, person's ears and perceptions. One tip for club DJs still uncertain as to what really audio quality sounds best for them is to have a controlled experiment before you start your next night. Try playing the same track in a variety of formats on the club soundsystem and see if you can tell a difference in quality. The chances are that everyone will have a different opinion, but that is DJing in a nutshell.